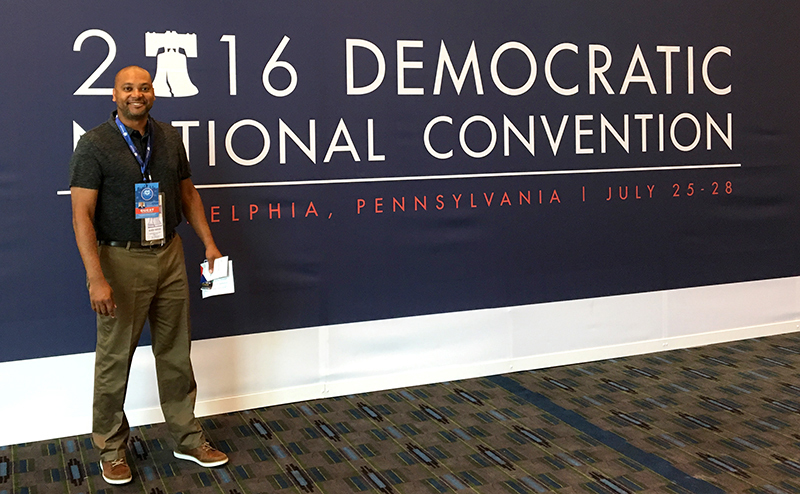 At the Democratic National Convention in Philadelphia, much more went on than was covered by CNN, MSNBC or Fox News. The Kegler Brown team spent most of its time interacting with the Ohio delegation during those times when the Convention was not in session. State Party Chairperson David Pepper has emphasized to officials that developing candidates and officeholders at the local level is as important as preparing for the statewide elections. Much time and energy has been spent helping those in office actually learn the skills necessary to govern effectively. Their goal is for more experienced local officials to be recruited as candidates for higher office in the future – not just those with easy name identification. Their confidence in large measure is based upon the ever-growing disapproval of Trump and his ongoing feud with … everyone, especially the unexpected boost from Trumps ill-advised verbal battle with a Gold Star family. Polls shortly after the convention have trended in Clinton’s direction, but have not yet shown the same movement in a key down-ticket election for U.S. Senate. Current U.S. Sen. Rob Portman has amassed an enormous fundraising advantage and inroads in labor, but former Gov. Ted Strickland enjoys enormous recognition and popularity with his previous supporters. Democrats supporting Sanders clearly wanted Clinton to adopt much of Sander’s campaign ideals, a number of which having been incorporated into the DNC convention platform. But Clinton’s campaign was well aware of the great wall of resentment building between Ohio Republican officeholders and the Trump campaign, which leaves an opportunity to seize both independents and disappointed Republicans. A pivot towards the center may attract disenchanted Ohio Republicans who cannot stomach to vote for Trump. However, very few Republican officeholders are openly advocating a vote for Clinton as the alternative, while a number indicate leanings towards a Libertarian candidate. Clinton will likely remain center-left since the disdain felt for Trump is from personality as much as it is policy. Political acrimony in Ohio’s U.S. Senate race appears limited to policy positions without outrageous personal attacks … thus far. Lieutenant Governor: Because candidates for governor and lieutenant governor run as a team, the identification of lieutenant governor candidates typically occurs late in the positioning process. Possible candidates include anyone who is talked out of running for any of the other statewide offices. Some of these names will likely shuffle and others may re-surface, such as U.S. Consumer Financial Protection Bureau Director Richard Cordray, the former State Attorney General, who cannot engage the Ohio political machine while holding that post. Several county-wide elected officials may begin touring the state, but whoever they are, they will have a steep uphill climb to gain name recognition throughout the Buckeye state. A White House victory – specifically one that includes Ohio’s electoral votes – creates momentum for Democratic statewide hopefuls, and sends the desired message to contributors. While elections for president and U.S. senator will dominate headlines, it’s clear that the Democratic Party is focusing efforts and resources on developing local and state candidates for 2018. Ohio voters and businesses alike would do well to pay attention to them, learning about and building relationships with the emerging candidates. This was Part 2 in a pair of articles about Kegler Brown’s attendance at both major-party conventions. Find Part 1, which looked at events and issues from the Republican National Convention and their significance to Ohio, by clicking here.